The native emulator is very slow in Android. But, you can make a faster emulator using Intel Atom x86, but only if your computer has an Intel processor. 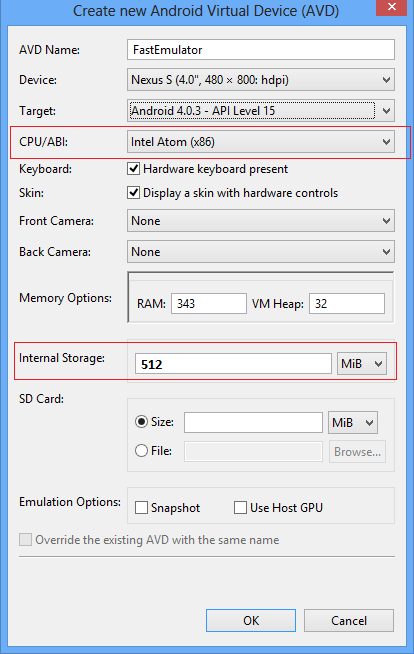 Now, you have to follow some steps in order to use the Intel Atom x86 Emulator. Step 2: Install the HAXM driver (Intel Hardware Accelerated Execution Manager). NOTE: This path might differ. It depends where you install your Android SDK. I usually install it in C:\Program Files (x86). I have Windows 64 bit so this is why my Program Files have (x86). 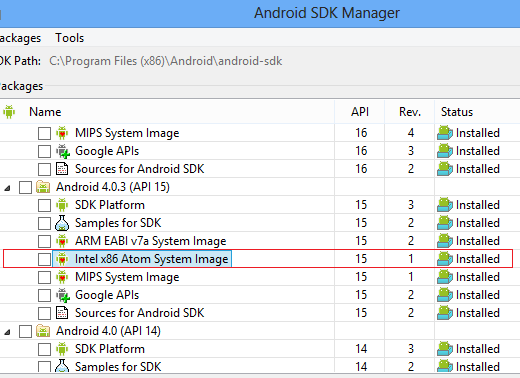 Now, if you didn’t install everything from SDK Manager, you must install the Intel x86 Atom System Image for your desired Android target. In our tutorial I will use Android 4.0.3 – API Level 15. If you meet all the requirements from above and you don’t need Google Maps, you are ready to use your faster emulator by creating a new emulator and select at CPU/ABI Intel Atom x86 (see the image from Step 3). We need to do this because we will have to pull out the Google maps from this emulator in order to push them into our Intel x86 emulator. Open cmd and put the following commands, but please don’t forget to use your OWN path where you installed the Android SDK. These commands will open your just created emulator. Now if you want you can remove this emulator. We won’t need it anymore. Now you have to create a new emulator but this time you have to choose your desired Android Target and set it to be Intel Atom x86 and also set the Internal Storage to 512 (this is needed because otherwise the emulator won’t have enough space to store all the maps). In my example I will use Android 4.0.3 – API Level 15.
and should have a size of about 280 MB. DO NOT forget to change the path if it is not like mine.